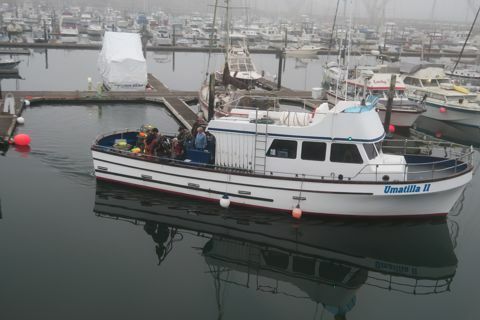 The working marina fired up before 6:30 – fish start work early – and since we had gone to bed (holding our full stomachs) early, we watched them go, then took a nap before our host, Michael, rang the breakfast bell at 8:30. And a delicious breakfast it was, including his new invention, ham and cheese on rye frittata. 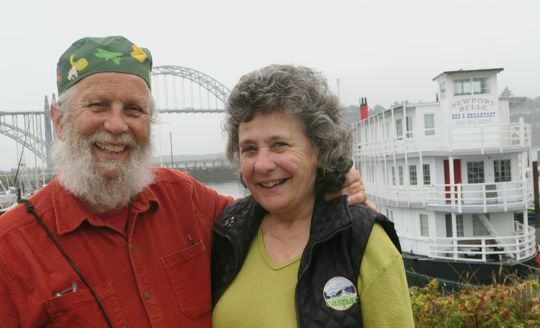 Almost immediately, we were caught in the Oregon Coast Portland Outsquirts Gridlock. Tries one's patience; on this day, still glowing from dinner and a night in the Owner's Suite of a river boat, my patience held up. The problem here, as I see it, is No Urban Planning. Stop lights every two blocks don't give the traffic on Highway 101 long enough to clear, so pretty soon only four cars (or one lumber truck) gets through on a green – complicated by Oregonians' habit of blocking the intersection and propensity for starting to cross well after the light changes to green. A shorter version of the problem: No Planning. 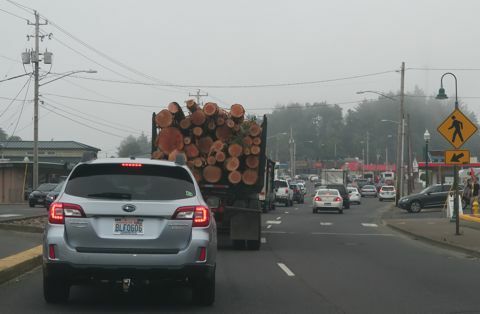 One common, depressing sight is lumber trucks with equal loads of skinny fir stems rolling past each other in opposite directions. Lincoln City, as usual, was a nightmare, as was Seaside; both are the closest 'attractions' to Portland and Salem. The strip development along that part of the coast is noxious. Between these two cities, Highway 101 gets skinny and unused, and winds over a ridge and then along a pretty little river, the Nehalem? 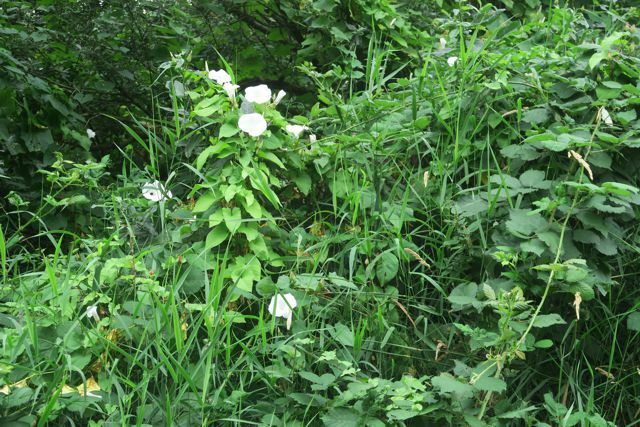 We stopped to stretch our legs and pick some blackberries, and were, as always, stunned by the riotous growth of untended verdure in every possible nook and cranny. The light, even miles inland, is still filtered by dense fog – the marine layer, curse it! We are ready for some sun, and so are the blackberries. We stopped there today and, not surprisingly, had a different experience. The plant's automated, and the unclean masses walk along a glassed-in gallery above the factory, where stainless steel machines, tended by a few techs, do the work. Nothing interesting enough to take a picture of, although the explanations of some of the machinery – the Cheddarmaster and the Robotic Unbagger, were intriguing. All very modern and reassuring, and I was given the impression that the resulting cheese is still real enough. 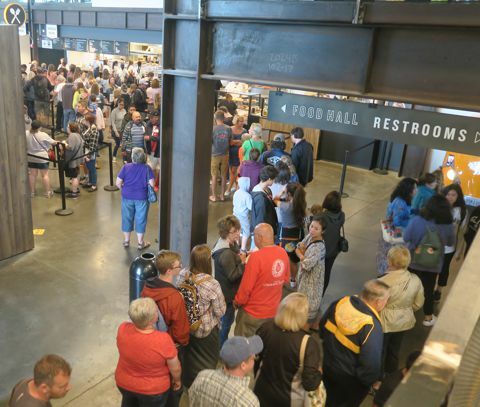 Down below, the food court was mobbed – the whole visitor side was mobbed, with long lines for 'free cheese tasting' and the ordering counter, even the store check-out. We're back in the Rose River Inn, a B&B a few blocks above Astoria's main drag. We stayed here at the beginning of our 2015 trip to British Columbia, and loved the view and the breakfast. Still foggy. You may be able to discern that the ship farthest out in the river – here it's more than a mile wide and tidal, more estuary than river – is in sunlight. Dinner at T Paul's Urban Cafe, just like 2015. 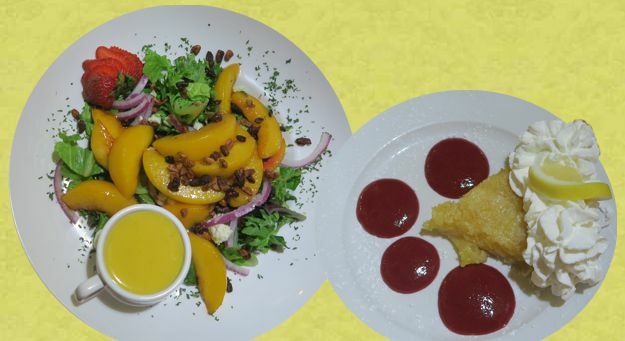 Had some gently fried oysters that were so good we had to go again, and a grilled peach and bacon salad. Not too much food. Oh, and for dessert: that's a Shaker Lemon Pie made with whole lemons, with an abundance of raspberry couli and whipped cream, OMG!